Martin Klaassen was born on April 27, 1820, in Grosswerder, Prussia to Jacob Klaassen (1793–1879) and Helena Hamm (1793–1870). Martin married Maria Hamm, who was his first and third cousin, on October 6, 1855. She was born on October 9, 1829 in Orloff, Prussia, to Michael Hamm (1790–1862) and Helena Klaassen (1798–1866). Together they had seven children. Martin and Maria immigrated to Russia where he was a teacher in the village of Köppenthal near Saratov, south Russia. In addition to his diary, he wrote the book Geschichte der Wehrlosen Taufgesinnten Gemeinden von den Zeiten der Apostel bis auf die Gegenwart, Danzig, 1873. Maria died on March 12, 1904. Martin died in Asia on November 24, 1881 during the trek with Klaas Epp who believed the second coming of Jesus was at hand and would happen in the east. Michael Klaassen was born to Martin and Helena on September 7, 1860 in Köppenthal, Trakt, south Russia. He was baptised in 1877, by David Hamm and in 1880, followed his parents to Central Asia under the leadership of Klaas Epp to await the second coming of Christ. Here he married Margaretha Jantzen (1865–1910) on January 10, 1884. In 1885 they immigrated to America, spending their first years in Beatrice, Nebraska. In 1894 they moved to Bessie, Oklahoma where he was elected minister of the Sichar Mennonite church in 1896. In 1901, he was elected elder of the Herold Mennonite church. For seventeen years he also taught German and Bible in the elementary school there. On January 10, 1910, Margaretha died. Michael married Katharina Dalke, who was born on February 2, 1884, in Hillsboro, Kansas, on March 30, 1911. During World War I, there was a push for young men to become enlisted in the military. Michael’s son, Johannes, was drafted but refused to be placed in the military, citing religious reasons. He, along with forty-four others, were imprisoned at Levenworth, Kansas. Here he died on October 17, 1918, of influenza. During this crisis in 1918, Michael moved his family to Canada and many of his church members moved along with him. In Morden, Manitoba he established another Herold Mennonite church. Michael Klaassen died in Morden, Manitoba on October 18, 1934. The records in this collection have come to the Centre at two different times. The first donation was on August 18, 1997. The Mennonite Heritage Centre in Winnipeg had received the diaries of Martin Klaassen, Margaretha (Jantzen) Klaassen, Johannes Klaassen, and Michael Klaassen from Esther Bergen. There were some duplicates and the director of the Heritage Centre, Lawrence Klippenstein, donated them to this Centre. On April 12, 1999, Lawrence Klippenstein forwarded a copy of Margaretha (Jantzen) Klaassen’s diary and a transcript of it to the Centre. 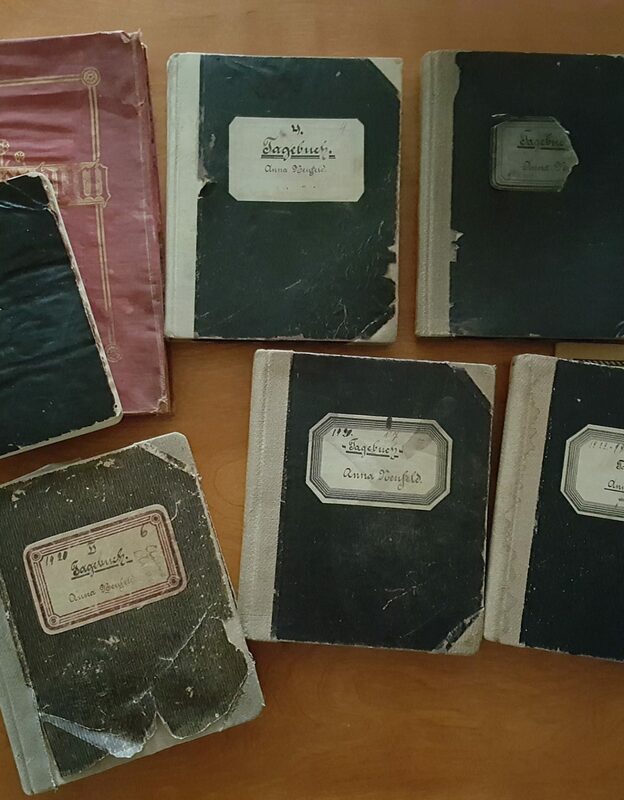 The material in this collection consists of copies of Martin Klaassen’s diary, Margaretha (Jantzen) Klaassen’s diary, correspondence with Johannes Klaassen, and the diary of Michael Klaassen. All the material is handwritten German Gothic script, except for a typed German transcript of Margaretha (Jantzen) Klaassen’s diary. Described by Conrad Stoesz December 20, 1999. Diary, Martin Klaassen, Tiegenhagen. – 1852–1870. Diary of Margaretha (Jantzen) Klaassen, and transliteration of the same. – 1880–1881,[198-?]. Correspondence to Johannes Klaassen. – 1917. Correspondence to Johannes Klaassen. – January 9–31, 1918. Correspondence to Johannes Klaassen. – February 2–25, 1918. Correspondence to Johannes Klaassen. – March 2–31, 1918.
Letters to and from brother Johannes Klaassen. – 1918. Correspondence to Johannes Klaassen. – 1918–1919. Michael Klaassen diary. – 1890–1902. Michael Klaassen diary. – March 1903-December 1907. Michael Klaassen diary. – 1908-February 1910. Michael Klaassen diary. – 1910–1913. Michael Klaassen diary. – 1913–1917. Michael Klaassen diary. – 1917–1922. Michael Klaassen diary. – 1922–1925. Michael Klaassen diary. – 1925–1931. Michael Klaassen diary. – 1931–1934. Genealogical data on the Klaassen family. – 1999.